The persistence of mesic savannas has been theorised as being dependent on disturbances that restrict the number of juveniles growing through the sapling size class to become Wre-tolerant trees. We analysed the population structures of four dominant tropical savanna tree species from 30 locations in Kakadu National Park (KNP), northern Australia. We found that across KNP as a whole, the population size structures of these species do not exhibit recruitment bottlenecks. However, individual stands had multimodal size-class distributions and mixtures of tree species consistent with episodic and individualistic recruitment of co-occurring tree species. Using information theory and multimodel inference, we examined the relative importance of Wre frequency, stand basal area and elevation diVerence between a site and permanent water in explaining variations in the proportion of sapling to adult stems in four dominant tree species. 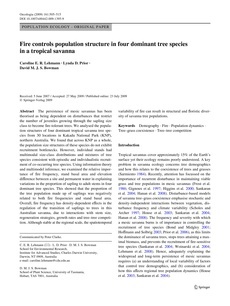 This showed that the proportion of the tree population made up of saplings was negatively related to both Wre frequencies and stand basal area. Overall, Wre frequency has density-dependent eVects in the regulation of the transition of saplings to trees in this Australian savanna, due to interactions with stem size, regeneration strategies, growth rates and tree–tree competition. Although stable at the regional scale, the spatiotemporal variability of Wre can result in structural and Xoristic diversity of savanna tree populations.